You’ve spent weeks on end choosing your destination, months deciding on the perfect cruise and even longer dreaming of getting away from it all. Of course, you’re going to want to sit back and relax but you’re also going to want to make sure that you remember your holiday for years to come. 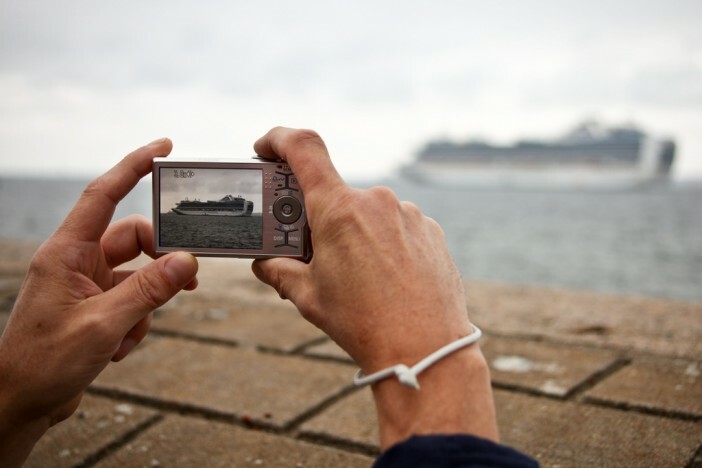 This is where mastering the art of cruise photography comes in. Don’t worry, you won’t need to be a professional photographer to pass this course, All you’ll need is a willingness to learn, a readiness to experiment and the enthusiasm to invest a little time in perfecting your pictures. Here’s how! As your new home for the duration of your voyage, you’re going to want to snap a picture of your cruise ship. The sheer size alone is definitely worth capturing. One of the best times to do this is early in the morning or late in the afternoon when you’ll get beautiful golden light. If possible, try to avoid taking pictures of the vessel as you embark for the first time as it’s likely that everyone else will be doing the same! If you’re taking shots of the interior, natural light is always best. If this isn’t possible, be sure to experiment with flashes and inside modes as this can have a huge effect on the overall mood and ambience of a shot. While you may be praying for sun, clouds can often make for stunning photographs. The shadows they cast add incredible emotion and depth, particularly when it comes to landscapes. Whether you’re shooting a port as you cruise into dock or exploring a destination on a shore excursion, remember that cloud coverage isn’t always a bad thing. The bigger picture isn’t always the better picture! When attempting to capture a real feel for your holiday, it’s often the more detailed pictures that say the most. Think about what it is that makes your cruise unique, and try to document this through your lens. Is there a glittering chandelier in the lobby, are you in love with the marble tiles in your bathroom, do you have a favourite cocktail that you just can’t get enough of? The key here is to get up close and personal with details to create an utterly unique holiday album. It may be cliché but let’s face it, at some point on your cruise you’re going to want to snap a selfie. Don’t be embarrassed, it’s something that everyone does at some point or another! Rather than investing in a cringe worthy selfie stick, why not try out a gorilla pod or a mini tripod? Using timer mode, you can then set up your camera in the perfect position, run into the shot and snap a lovely photograph, minus the awkward selfie pose. Food is without a doubt one of the most exciting experiences you’ll have on-board a cruise ship. Today’s vessels offer incredible dining options, with a plethora of celebrity chefs now lending their expertise to the kitchens. Not to mention all the tantalising local flavours you can sample while exploring ports of call. If you want to photograph your food journey we advise snapping shots from a bird’s eye perspective. It looks far more professional and really captures the aesthetics of a dish, particularly if there is a focus on presentation. You may need to stand up and hover over your plate but trust us, it’s worth it! When you disembark to explore a port of call having your camera on hand is a must. After all, who knows what sights you could see? One of our favourite tips is to seek out colour groupings to create fun and artistic shots. Whether it’s a kaleidoscopic line of beach umbrellas or colourful painted doors in a charming old town, let your eyes scan spaces and find colour patterns that capture the attention. Whether it’s snapping a shot of your loved one gazing out to sea, documenting a child’s back as they run down the gangway or taking a picture of your feet in the sand, remember to capture moments that suggest a sense of ‘journey.’ Context is important for this one so always be sure to think about how a photo will convey where you were, or how you were feeling at the time. If you’re lucky enough to spot wildlife on your cruise we’ve got some great tips. First of all, the rule of thirds is a tried and tested way to set up National Geographic worthy shots. If you have a good lens, getting as close and possible and zooming in to the extreme is a fantastic way to capture incredible detail. Whether it’s the wrinkles on an elephants skin or the gleaming eye of a dolphin, these detailed shots will seriously enrich your album. It’s always a good idea to set your camera mode to action shot as animals are like kids and don’t tend to stay still for long! Landscapes, animals and family members are all important however it’s also valuable to snap photographs of the people who made your cruise extra special. From fellow passengers and attentive crew members to friendly tour guides and fascinating locals, these are the types of shots that add context and intrigue to your album.